Today I suddenly started craving crepes. 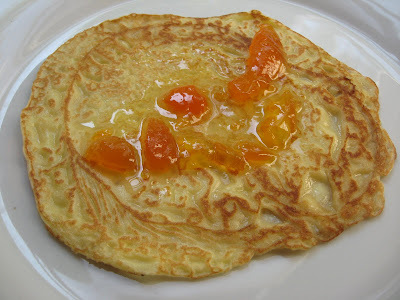 As I whipped up the batter from Mastering the Art of French Cooking, I was reminded by the scrawl on my birthday calendar that tomorrow is Julia's birthday, so I hastily raised a fork full of these delicious, apricot-stuffed dessert pancakes to Julia's dear memory. When I worked in a French restaurant, I was the crepe maker - stacks and stacks of crepes for dessert, and often for a savoury fruits de mer entree. It's hot work, and you have to work fast, but once you get the hang of it, you can whip out a few dozen without any trouble. A crepe pan is a must for me, with a heavy bottom that holds the heat, as well as asbestos fingertips, if you tend to flip them with your fingers, as I do, instead of the more sensible spatula. Place the ingredients ( in the order listed) into the blender. Puree and add a little more water if the batter is too thick. When you ladle it into the hot pan, you need to swirl it quickly, which won't happen if the batter is too thick. Let the batter sit for 2 hours in the fridge. Place a stick of unsalted butter on a plate near your stove. Heat up the crepe pan ( or omelet pan works, too) and swirl the tip of the stick of butter around the pan. The heat should be at medium. Using a small ladle, scoop the batter out and , using a swirling motion, drizzle into the hot pan. Immediately grasp the pan's handle, and tip it around and back and forth so the batter covers the bottom of the pan. After a minute, the edges will look bubbly. Another minute and you're ready to flip it quickly, using a spatula. Cook another minute or so, then flip the crepe out onto a platter. Continue to butter the pan, scoop the batter, and cook until batter is gone - this makes around 10 crepes. If you're serving them right away, simply flip onto a plate, spoon some chunky apricot preserves around the disc of the crepes, and roll up. Three to a plate is usually plenty per person. Dust a little confectioner's sugar on top and serve. 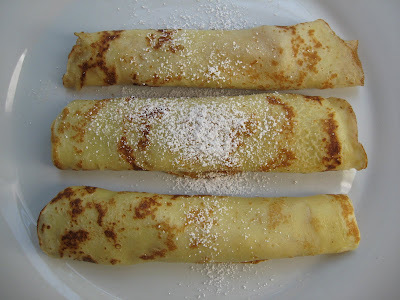 If you're holding them, place squares of waxed paper between the crepes so they don't stick together. And blessed Happy Birthday, Julia! Where would we be without you? Your crepes look so appetizing I can SMELL them! Love apricot jam filling. Simple... simply delicious. 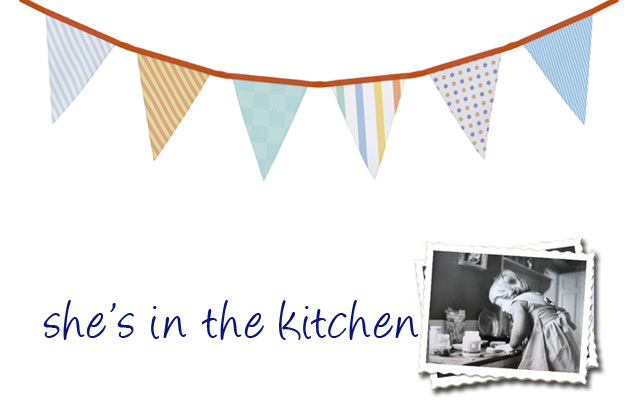 Thanks for the recipe..the birthday reminder and the Crêpe Toast to Julia! Thank you , Kate! I should add I've found the Trappist brand of Apricot Preserves to work just wonderfully with these. Simple, but delicious and light, but filling. Yummers. Thank YOU, Nana - and hope you think of her tomorrow with a Crepe ( and maybe champagne) Toast! Do you know, I've never made crepes. I did used to enjoy them when I worked in a French restaurant, especially the breakfast crepes with eggs and ham! Your version looks delightful. Ah, Kalyn - it was a blast from the past taste sensation when I ate these yesterday - the traditional way, with apricot preserves. What a lovely way to celebrate Julia's birthday! I've never made crepes, and I seem to keep thinking about them lately. This sounds so good, I think I have to try it! I love crepes, especially with Nutella, banana, strawberry and whip cream. My goodness, Lisa - that sounds like quite a dessert! Thanks, Barb! 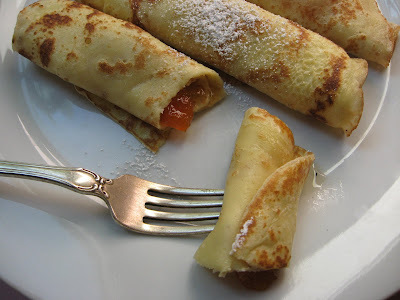 I adore crepes, and really prefer them with just a little apricot jam. Could it be part of the simple and delicious taste is my memory of Le Bocage and 120 degree days in the summer kitchen there? Though I am happy to see that crepes are making a comeback ( my son frequents a fabulous crepe place in Portsmouth/Dover, NH), when I hear about whipped cream and fruits, sauces and creamy fillings, I wonder if I would like them so gussied up! Do try! how fun! Love the crepes! Hello, chefs! Delighted you enjoyed this homage to Julia! Oh, YUM, what a perfect recipe to try this weekend. I love the rich color you wound up with! Thanks for the recipe and the idea. I'll be sure to let you know how they turn out. Thanks, Jeff! I think you'll really enjoy these crepes, whether savoury or sweet - perfect for this humid weather. Do let me know how it goes!